You’ve heard Rotary described as an organization where leaders gather together to share ideas and take action. I’ve been reflecting on how effectively Rotary does deliver on that leadership promise! We are both an organization of leaders, and an organization that develops leaders. Club Leadership Academy Returns on Saturday, April 21! Register by MARCH 15 for Early Bird Pricing! 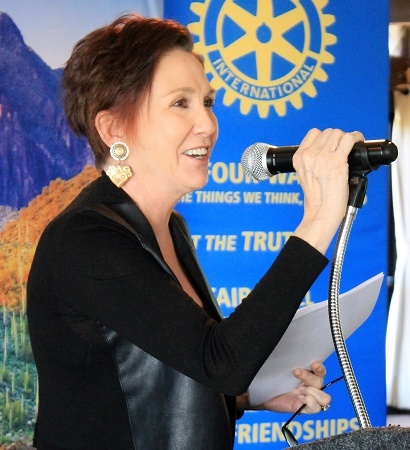 Past President Mary Blank introduced Christina Lanoue, AVP of Property Management for Scottsdale Fashion Square, to Rotary Club of Scottsdale members and guests at a meeting held at Scottsdale's McCormick Ranch Golf Club's Pavilion. 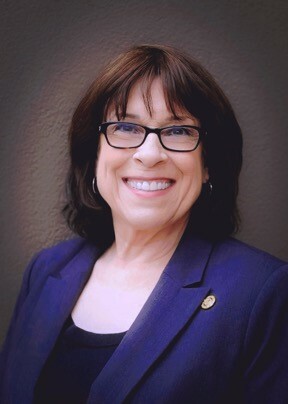 Lanoue oversees all facets of property management and operations for Scottsdale Fashion Square. A shopping industry veteran for more than 40 years, Lanoue was a store manager and buyer for Federated Department Stores, as well as, a divisional leader and buyer for Bullocks and Goldwater Department Stores. If you are currently a Rotarian and have had a passion working with your club as a counselor or club Youth Exchange officer for the Rotary Youth Exchange Program, consider being a local coordinator. We are looking to gain coverage with our local coordinator team throughout the valley in the Peoria, Anthem, Gilbert, Tempe and Mesa areas. You will be supported by our district Youth Exchange Committee, and they will be there to help with training and to answer any questions you might have along the way. allow me friendships and to stay in touch. and the truth is the base which all dealings depend. in all my dealings because it is the best! Chandler Horizon Welcomes Home the "Houston Warriors"
As we learned in the Area 8 story in February, Chandler Horizon had a group of Rotarians who helped out in the Houston area after the devastating floods. 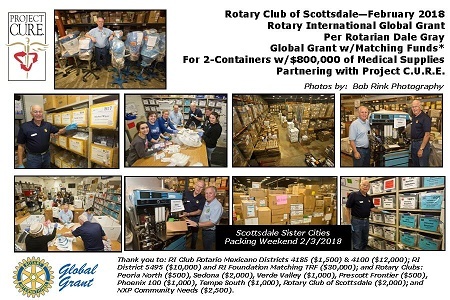 Do you have concerns about how things operate at Rotary International? Then you may submit a resolution to Rotary International. What is a resolution? The Council on Resolutions meets online every year to vote on proposed resolutions. Resolutions are requests to the Board or the Trustees to take an action that is outside the purview of the constitutional documents. 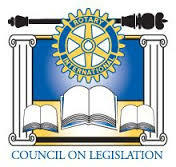 Ideally, a resolution should affect the Rotary world, rather than address local or administrative issues. My favorite part about membership is the many resources available to you and your clubs. Looking for an easy way to add a little recognition to your meetings? Encourage everyone to fill out their club profile! 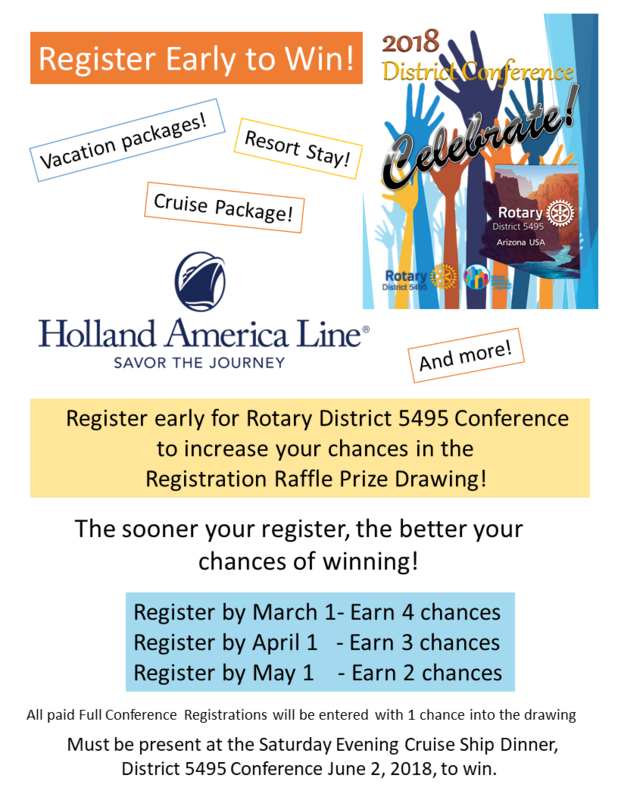 Now, you have a perfect way to celebrate birthdays, milestone anniversaries and Rotary anniversaries. You can also sign a card and mail it to them. Grab a cup of coffee and read through Engaging Your Members, a resource available at rotary.org. I attached the link below. This guide has some great practices for creating a membership plan. Happy reading. 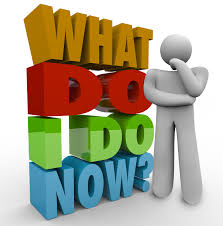 When crises occur, we are often left wondering who to call first and how to properly respond. We are pleased to now have a plan in place that can be followed to ensure that the matter is handled with the utmost care. There’s even a page at the end to include your own important club’s contact info. You’ll want to get familiar with this new resource for clubs. Note: This document is also available on the District Website under Member Resources. For anyone who has ever wanted to learn more about Rotaract, here’s your chance to connect with the emerging leaders in Rotary. March 12-16 is World Rotaract Week and the 50th anniversary of Rotaract. 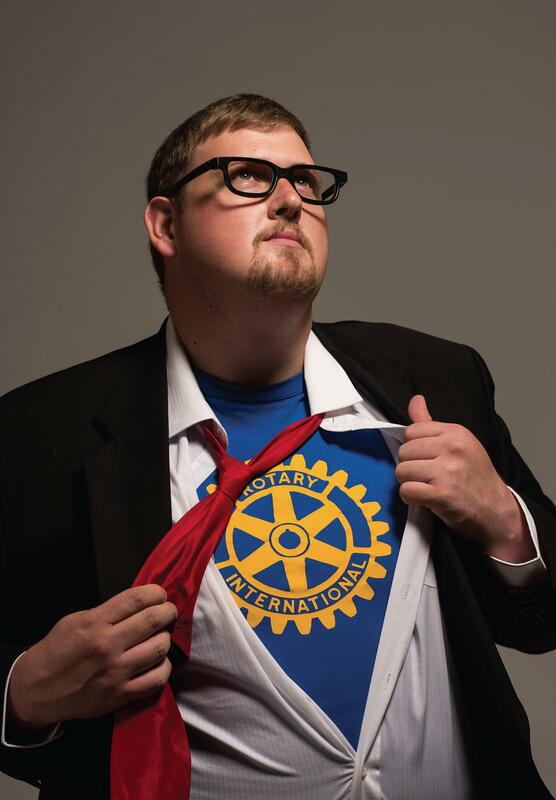 In celebration, there are a slew of events planned, which are open to everyone in Rotary. 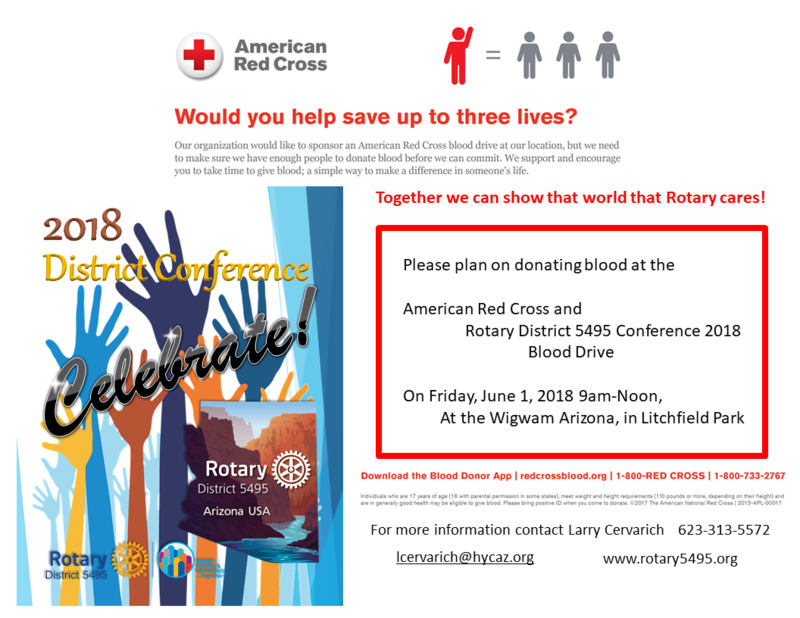 They are targeted around the valley to ensure that any and all Rotarians can attend. March 12: International Project – ASU Tempe campus, Wrigley Hall Room 202, 105 E. University Drive, Tempe, 6-7 p.m.
March 13: Service Event at Feed My Starving Children in Mesa, 1345 S. Alma School Road, Mesa, 8:30-10 p.m.
March 14: District Rotaract Fundraiser at As You Wish at Westgate, 9410 W. Hanna Drive, Glendale, 6-9 p.m.
March 15: Emerging Leaders/Rotaract Social at Bevvy in Old Town Scottsdale, 4420 N. Saddlebag Trail, Scottsdale, 4:30-6:30 p.m.
For more information, visit the Rotaract Club of Phoenix Facebook page. 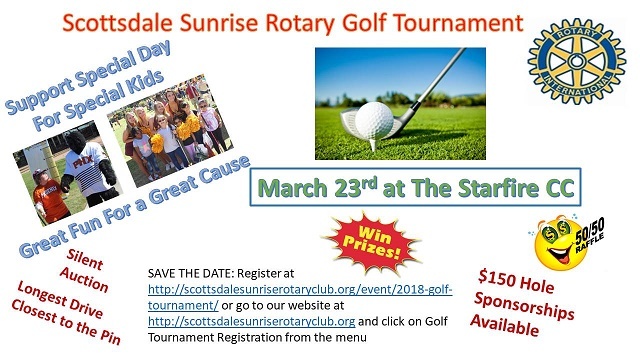 The Scottsdale Sunrise Rotary Club is holding its annual golf tournament on Friday, March 23, at the Starfire Country Club to raise funds for their 33rd Annual Special Day for Special Kids, as well as other community service projects. Special Day for Special Kids is a day of fun, games and great experiences for some very special kids and their families. RYLA 5495 Pinerock just completed its camp in Prescott and it was a huge success. Kudos to the staff who made this possible. RYLA 5495 Ponderosa in Heber is coming up from April 5 to 8. We hope to have a terrific camp also. As part of the RYLA curriculum, students are introduced to a community service project – Kids Against Hunger (KAH) meal packing through the Manzanita Outreach Organization, an Arizona Charitable Tax Credit organization. RYLA 5495 Pinerock once again packed over 42,000 nutritious meals packed in three hours, with the packaged food distributed to local emergency providers in Apache Coumty. 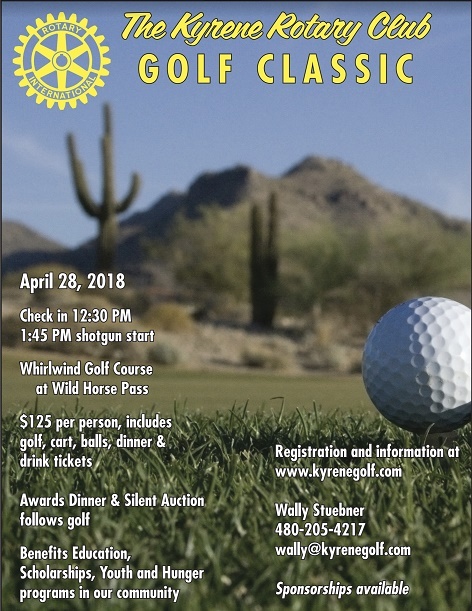 Join the Kyrene Rotary Club’s Golf Classic on Saturday, April 28 at the beautiful Whirlwind Golf Course at Wild Horse Pass, just south of Chandler on I-10.